White Outdoor lawn tractors are one of the several brands manufactured by the MTD company. These mowers were made with price in mind. Despite the low cost, white Outdoor brand has features seen on more expensive brands, such as a cast iron front axle and hydrostatic transmission. A twin cylinder Kohler overhead valve (OHV) 4 cycle engine is an option, as well as a single cylinder overhead valve 4 cycle Kohler engine. Both the models available feature a grass mulch option,allowing for recycling of the grass clippings. The deck cutting height is adjusted manually using a lever. The front axles on these machines is fabricated of cast iron. This is the sturdiest material available for a lawn tractor front axle. The frame design on all the White Outdoor lawn tractors feature the ‘step through’ design. This eliminates any obstructions in front of the drivers seat. This allows for easy entry and exit from the tractor without the need to lift feet and legs over a raised portion of the frame. White Outdoor has 2 models to choose from- the economical model LT 46and the more expensive model LT 50. Model LT 46 is the lower priced option, and comes standard with an overhead valve single cylinder 20 HP engine which powers a hydrostatic transmission. The PTO engages the 46” triple blade cutting deck manually. Model LT 50 is equipped with a more powerful 2 cylinder 22 HP engine and an automatic gear transmission. The PTO is electric on this model, and drives a triple blade 50” cutting deck. Both versions of the engine feature a pressurized oil system, with a replaceable oil filter. Special features available on the higher priced model LX468 include a high back seat, and front bumper to help protect the tractor hood from collision damage..
Count on spending about $1400.00 for the LT 46, and about $1700.00 for the LT 50. 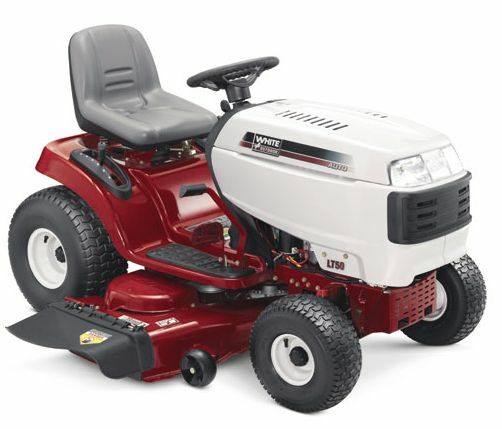 Considered a middle of the road or entry level machine, the White Outdoor lawn tractors come equipped with features found on much more expensive tractors. For many customers, this will be a good brand to consider for the price and the value provided.